Silver Twist Earrings with Gold Granules-10 ga. These are reduced price since one of the granules has a gap; it’s solid, but you can tell if you look closely. I choose Argentium Silver because it is resistant to tarnish, it’s hypoallergenic, and is made with reclaimed silver. These are 10-gauge wire earrings with a 22K gold granule fused into the lower-half. The fish hook style hangers are gold-filled. They weigh 2 grams each and are about 1” long (25 mm). For this product, I take new photos for each listing. What you see in the pictures is exactly what you will receive if you order. The following description of Argentium Silver is courtesy of Rio Grande: Made with a touch of germanium, Argentium® Silver presents a bright white color that is closer to fine silver than traditional sterling, yet is highly resistant to firescale and less likely to tarnish under most conditions. It welds flawlessly and is ideal for fusing techniques. All Argentium is made from reclaimed silver and its sources are guaranteed by Argentium International Ltd. 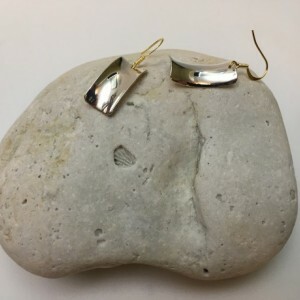 Your customers will appreciate the value and convenience of brighter-white sterling silver designs that resist tarnishing and keep on shining. 2.1 grams each, and measure approximately 0.4” wide (11 mm) by 1” long (25 mm).